With the Stylus 410, Olympus adds improvements and refinements to its popular all-weather Stylus 400. 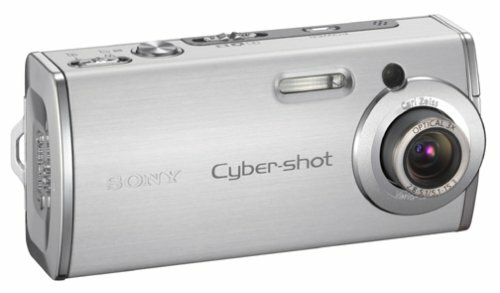 This 4-megapixel digital camera still features a 3x optical zoom and a splash-proof design that protects the camera even on rainy days. 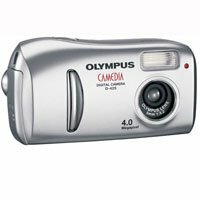 But it also adds an all-weather microphone for movies with audio and Olympus's new TruePic Turbo image processor, which speeds up the camera's start-up, shutter lag, recording and playback time. Featuring a 4.0-megapixel CCD sensor, the Stylus 410 delivers images up to 2,272 x 1,704 pixels and photo-quality 11 x 14-inch enlargements. It also features 2048 x 1536, 1600 x 1200, 1280 x 960, 1024 x 768, and 640 x 480 resolution modes. An Olympus 3x optical zoom (and 4x digital zoom for a seamless 12x total) gives you the ability to fill your pictures with sharp detail and vibrant color. The high-quality, all-glass lens (with aspherical lens elements) is specially designed for digital cameras, and provides a focal range of 5.8-17.4mm (35-105mm equivalent in 35mm photography). The Stylus 410 now adds sound to its movie-making capabilities (thanks to its all-weather microphone). You can record video at 15 frames per second (fps) in two resolution modes: 320 x 240 and 160 x 120 pixels. The length of the recording is only limited by the capacity of the XD memory card. The lightweight and ergonomic metal body of the Stylus 410 provides all-weather protection from the elements--perfect for any condition from a downpour to snowy slopes to whipping sea spray on a sailboat. Rubber gaskets throughout the camera's interior insure that rain, sleet and snow can't stop the Stylus 410 from taking great shots. A range of automatic functions such as TTL autofocus and Digital ESP (Electro Selective Pattern) light metering help ensure best results with the minimum of fuss. The Stylus 410 boasts a scene program for every occasion: Portrait, Self Portrait, Night Scene, Landscape, Landscape with Portrait, Beach and Snow, Cuisine and Indoor. The Stylus 410 is the first Stylus model to feature TruePic Turbo, a new image processor that sharpens image clarity, contrast, and color for life-like results. This feature also makes the camera 30% faster in processing images and is combined with a super-fast shutter release time. With a clamshell lens barrier (pioneered by Olympus) and an artistic design inspired by the beauty of ocean waves, the Stylus line has won numerous awards and accolades such as being displayed at New York City's Metropolitan Museum of Art. The camera has a sliding lens barrier attractively accented in silver and gold, and a champagne gold body that blurs the line between technology and artistry. Use the Virtual Dial--viewed from the 1.5-inch LCD (134,000 pixels) to select from among ten shooting modes to determine the best option for the situation and receive optimum picture results. The Stylus 410 is PictBridge compatible, which enables you to transfer pictures from your digital camera to a compatible printer (such as the Olympus P-10), without a PC or image-editing software. All PictBridge devices share three basic features: camera-to-printer connecting, single-image printing, and uniform error messages (in case something goes wrong). Images are stored on XD Picture Card memory cards. The card's small size, about the same as a postage stamp, helps to keep the camera size down. The included 32 MB card will store approximately 16 images at 2,272 x 1,704 pixels (at HQ, JPEG setting). Images can be downloaded to either a Mac or PC via USB 1.1 connectivity, which means the camera can be connected to any USB-based Windows 98 Rev2Me/2000/XP and Mac OS 8.6 or later computer without installing any software. The camera is powered by a proprietary, rechargeable lithium-ion battery (LI-10B; included). It measures 3.9 x 2.2 x 1.3 inches (W x H x D) and weighs 5.6 ounces (excluding battery and storage media). Excellent Camera for Outdoors/Recreational Use! 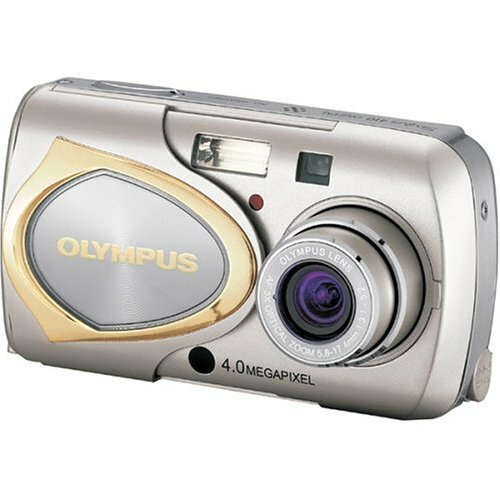 The Olympus Stylus 410 is great for my needs. I use it for snapping photos around campus and on outdoor adventures. The 410 takes quality photos outside, but inside is a different story. When the light is good, and flash is not required, the photos come out very well. When flash is required, people often complain about how bright it is--and how much more brighter it is than other cameras. The flash also makes the photos turn out horribly, in some instances. If you need a digital camera for outdoors/recreational use, the 410 should suit you well. Not only does the camera take excellent outdoor photos, it also makes reds and blues more radiant. I look forward to boating and canoeing this summer! One suggestion: buy a 128 or 256 MB card-you'll need it! Great line of cameras - lots of misinformed users! - Never buy a camera that uses non-rechargeable batteries (i.e. AA). You'll go through piles of them with even light usage. They'll die just when you need more. Why is it so hard to simply recharge your Li-ion battery more often than letting it run down to zero? - I know it so hard to be inconvenienced, but you have to press the shutter down so the camera can focus. If you're on a strange angle or poor lighting, the camera just won't take the shot - it's trying to focus during that time and conks out. Anyone who wants "instant" shutter snaps needs to return to analog film. - Who wants all this extra bulky photo editing software? I just want to plug the camera into my computer's USB slot and download the photos without all this baby-handholding "editing software" that comes with other cameras. Only the Olympus allows you to do that. If you're at someone's house or at work or wherever, you can download right to their computer. Can't do it with others if they don't have the editing software CD. Beats Fuji and Canon, this camera. 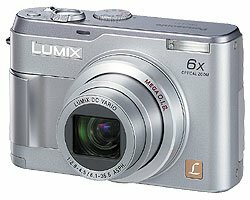 The first thing I tell people when they ask me what sort of digital camera they should buy is: "Make sure you buy one that doesn't use a proprietary battery." In other words, if you can't walk into a drug store and buy batteries for it, keep looking. Any battery can go bad, even rechargable lithiums (all it takes is one out of the three to die and you're out of business). I'm a big fan of rechargable AA batteries. Take two sets with you on vacation and if something goes wrong, drop into a drug store and buy replacements until you can find more rechargables. 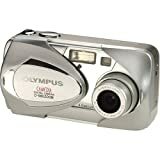 I have, however, found that Olympus makes the best digital cameras I've ever used. The D-550 3-megapixil is superb and it uses AA batteries. One of its best features is in the Camedia software that comes with it. It corrects for the distortion found in ALL single lens digital cameras. If Olympus goes to propriatary batteries, they've lost me as a customer. I don't want to be out in the middle of nowhere and suddenly have my battery go down. Nor do I want to find out, three years from now, that my battery is special order only and goes for an exorbitant price. I've got a laptop computer by Lexmark in my closet that I could still be using, except the proprietary battery's no longer being made. 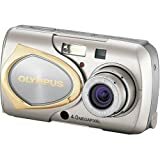 Finally, while the Olympus Stylus 410 4MP Digital Camera renders very nice photos, it has minor annoyances like "noise" -- digital interference that pros can spot as coming from a digital camera. In low light, it also suffers from a slight purple cast in dark areas, neither of which my D-550 has. After batteries, quality of photos is my next big buying point. This camera is capable of taking great photos that are frameible, but you'll have to add Photoshop Elements to the purchase to boost saturation and change color casts. The camera's the right size. Anything smaller and it becomes unweildy. I've gotten superb pictures from a cheap Olympus 2.2 pixel camera; so when it was time to upgrade, I chose this one. The pictures from this camera were inferior to my old Olympus. Low light capability was poor. Image quality was extremely poor. I returned the Olympus and purchased a Canon S410 digital elf. It's much better. I've had my camera a bit over a year now, and I have come to know its good points and idiosyncrasies as well. I chose it because of the 4 megapixel quality and my prior use of its film cousin. I rate it four stars because it isn't a professional level camera- though it is very good for casual shooting and "memory" photos. I also love the dust- and water-resistance of this camera. In typical Stylus build, it has protective gaskets for every opening - and I have used this camera in gear-jamming dusty locations as well as very moist ones (Iguazú Falls, salt water small boat cruising.) It's taken very good scenics (including really nice sunsets) and people photos. It is fairly quick as long as I have pre-focused, and I am only taking one or two photos (always at high quality.) The software allows you to "stitch" several photos together for a panoramic view, and its convenient compactness feels good when I am visiting where tourists with flashy cameras are targets for thievery and muggery. When it is closed in its self-contained "clamshell", it fits discreetly in my pocket. What don't I like? The menu system, if you want to use it to its maximum capability, can be exasperatingly counter-intuitive and arcane. The extensible lens, when extended to its maximum length, can be subject to distortion if you press against it. This camera is NOT for anyone who needs telephoto (sports or wildlife? get a digicam with 10x OPTICAL zoom - NEVER use the "digital zoom" feature on any digital camera, disable it!) The screen can be difficult to see in bright conditions - use the viewfinder, disable the screen (which will also save battery energy,) realizing the photo will show a bit more than the finder will and leaving you a little cropping room. It also can get expensive when you buy extra batteries and large-capacity proprietary xD cards, but then when I compare it with many rolls of film, processing and knowing what I have only when I'm back from the trip, not to mention reusinig the batteries and cards, you will save lots of money if you take lots of photos like I do. Remember that even without a telephoto, camera motion is your enemy - practice breath control and squ-e-e-ze the shutter release, brace the camera - carry a folding table tripod, use a table, wall or chair as a base in low light conditions. I've got some unforgettable (and sharp!) sunsets, Eiffel Tower at night, etc. with my plastic folding angle-leg table tripod or pressing the camera against a lamppost, using this camera. 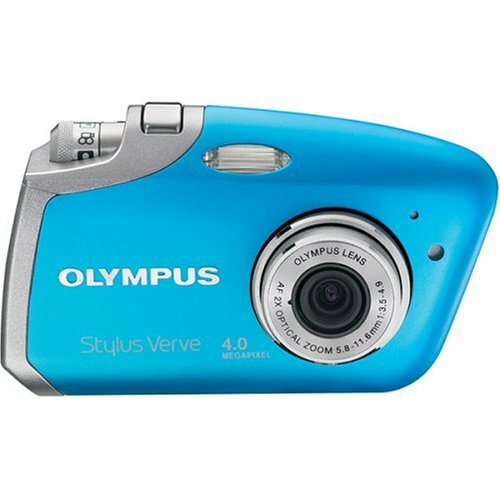 Compact and stylish, the Olympus D-590 makes it easy to snap clear pictures with amazing details wherever you roam. It features a 4-megapixel resolution, 3x optical zoom, a 1.8-inch LCD that provides a brilliant display even in bright sunlight, and a movie mode with sound that can capture as much video as your memory card can handle. The 1/2.8" CCD captures 4-megapixel images for printed enlargements up to 11 x 17 inches. Image resolutions include: 2272 x 1704 (4MP), 2048 x 1704 (3MP), 1600 x 1200 (2MP), 1280 x 960 (1MP), 1024 x 768, and 640 x 480. The lens, which is seated in the top-right corner of the camera's front, has a 5.8-17.4mm focal range (35-105mm equivalent in 35mm photography) with an f3.1 to f5.2 aperture range. The camera has a 3x optical zoom and 4x digital zoom for a total 12x zoom. In addition to still images, the D-590 also captures QuickTime video with sound at two resolutions (320 x 240 and 160x 120) at 15 frames per second (fps). The D-590 has a durable ultra-compact polycarbonate body finished in bright silver combined with a new look for the D-Series that replaces the sliding clamshell lens barrier with a modern looking circular lens cover that folds into the camera's body for convenience. The 2.5 inch LCD boasts 134,000 pixels, is impressively clear, and makes light work of sunny weather. Innovative sunshine LCD technology uses semi-transparent layers that allow light to penetrate a few layers into the panel before it is reflected back. This, along with a backlight, preserves contrast to ensure the LCD presents dazzling images in all conditions. 10 preset Scene Modes provide fully automatic exposure adjustments to make it possible to capture the best shot in a variety of settings: Full Auto, Portrait, Indoor, Beach and Snow, Cuisine, Portrait-Landscape, Landscape, Night Scene, Self Portrait, Movie. Images are stored on XD memory cards. The card's small size, about the same as a postage stamp, helps to keep the camera size down. The included 16 MB card will store approximately 16 images at 2272 x 1704 pixels (at HQ, JPEG setting) without sound. Images can be downloaded to either a Mac or PC via USB 1.1 connectivity. The D-590 is PictBridge compatible, which enables you to transfer pictures from your digital camera to a compatible printer (such as the Olympus P-10), without a PC or image-editing software. All PictBridge devices share three basic features: camera-to-printer connecting, single-image printing, and uniform error messages (in case something goes wrong). The D-590 is powered by a lithium-ion rechargeable battery (LI-12B). It measures 3.9 x 2.28 x 1.39 inches (WxHxD) and weighs just 4.3 ounces. The Kodak EasyShare LS743 combines compact design, enhanced sharing features, superb image quality, and ease of use to help you capture and enjoy those moments that make life enjoyable. The sleek, slim aluminum LS743 is slim enough to easily fit in your pocket, and it weighs under 6 ounces. 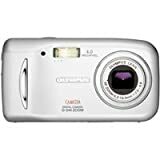 It features a 4-megapixel resolution, professional-quality Schneider-Kreuznach C-Variogon 2.8X compact optical zoom lens, Kodak's new Color Science image processor, movie mode with up to VGA resolution, 1.8-inch LCD, rechargeable lithium-ion battery, 16 MB internal memory, and compatibility with SD and MCC memory cards. For a step up in price, the LS753 offers a 5-megapixel resolution and a 32 MB internal memory. Optics and Resolution The LS743 has a 4-megapixel resolution for 2304 x 1728 images and photo enlargements up to 20 x 30 inches. Other resolution modes include 2304 x 1536 (4 MP, 3:2 aspect ratio), 1656 x 1242 (2 MP), and 1200 x 900 (1 MP). The Schneider-Kreuznach C-Variogon 2.8x optical zoom lens is also supplemented by a 3.6x digital zoom. Working with renowned German professional optics designer Schneider-Kreuznach, Kodak equipped the camera with an f/3.0 - 4.9 aspheric lens with a 6-16mm focal range (36-100mm, 35mm equivalent). The LS743 can capture both full-motion video (24 frames per second at 320 x 240 pixels, or QVGA) and TV-resolution video (VGA; 640 x 480 pixels at 13 fps) with capacity dependent on available memory (16 MB internal memory included; additional memory may be added via the SD/MMC expansion slot). You can also limit the length of your clips to 5, 10, or 30 seconds. With the 16 MB memory, you can shoot a 2-minute QVGA video. Images can be stored within the LS743's 16 MB internal memory, or on optional Secure Digital (SD) or MultiMedia (MMC) memory cards. It connects to Macs and Windows-based PCs via USB 2.0 connectivity. With a touch of the red-jeweled Share button, you can store up to 200 pictures in an on-camera digital album. These pictures can then be shared anytime on the camera's large, 1.8-inch, high-resolution (134,000 pixels) indoor/outdoor LCD screen. The Share button also allows selection of photos for printing and even e-mailing, with up to 32 e-mail addresses stored in the camera's memory. Kodak's Color Science Image Processing Chip offers a new high-speed digital image processor, advanced algorithms, and hardware acceleration features that enable the LS743 make simultaneous, split-second decisions to produce rich, vibrant, true-to-life colors in almost any lighting situation. Each time you click the shutter, the Kodak Color Science Chip performs an instantaneous and advanced analysis of collected scene data to identify and correct multiple factors that influence picture quality. Scene light source is detected and adjustments are made to capture bright whites and true, vivid colors under difficult lighting conditions--fluorescent, tungsten or daylight. Scene content is analyzed for luminance, focal distance, subject matter orientation and color to determine the correct exposure and capture the natural details, accurate flesh tones, and rich colors you see in your composition. The LS743 is powered by a proprietary rechargeable lithium-ion battery (1050 mAh), which can be charged via the included battery charger or an optional EasyShare Camera Dock. The KLIC-5001 battery can shoot approximately 350 images on one charge. The camera measures 4.3 x 1.9 x 1.2 inches and weighs 5.8 ounces. This package contains the EasyShare LS743 digital camera, rechargeable lithium-ion battery (KLIC-5000), battery charger, neck strap, USB and A/V cables, and custom camera insert for optional EasyShare Camera and Printer Docks. This is my first Digital Camera purchase - and BOY am I glad I got the Kodak LS743! I have a husband & 2 daughters and I take pictures all the time-My film developing bill was high! Now I can pick and choose the shots I want to print. I can also create family albums on the computer - to eventually be put onto CD's & set to music! They have the 5 megapixel camera's out, but I really don't think that I see that much of a difference with this 4 megapixel. I get Great photos-sharp & clear. And the zoom lets me be flexible with my shots. The color is awesome!-These pictures turn out beautiful!! This is a smaller camera than any I saw. I like the sleek design. You can also shoot 2 minutes of QVGA video. I haven't done enuf with this feature yet, but I know it's longer than some camera's on the market allow for video time. I have used the Auto mode quite a bit while getting used to the camera, but it also has portait, close-up, night, sport, snow, & many other modes! It has flash, & red-eye reduction. You can even store email addresses in the camera & hit the "share" button to share special photos with your contacts. It comes with a rechargable lithium-ion battery and a sleek charger that you can plug into an outlet. This camera is simple to learn & the pictures are amazing! I highly recommend this camera! I've been considering a digital camera for almost a year, and my in-laws have a Kodak 6330 that they like a lot. Kodak's general ease-of-use was a definite draw to me. I bought the LS743 yesterday, and it was very easy to set up and begin using. Battery life is excellent, and the battery is rechargeable (I bought a 2nd battery for only $20 to have a spare, too). The camera is compact but seems very well-put-together. My in-laws have a 6000 dock, and this camera will work on it, too. The lens is an upscale lens that is supposed to be a bit better than Kodak's lower-end models - I haven't taken enough pictures yet to notice the difference. All in all, great little camera! If you are a DP Pro, then please dont read this review. But, if you are like the majority who wants an easy, reliable Digital camera and 'MOST OF THE TIME USE BASIC FEATURES ONLY' person you must read on. I bought this camera after doing lot of research in the net and feedback from my peers. When I got this, I was amazed to see the picture quality and easiness in using it. I was shooting with in 3 hrs after the Fedex guy left. (You've to charge the battery for ~3 hours before first use). I still have to invent all the advanced features and modes of the camera. But, if all DEFAULT and AUTO modes are this good, then I am sure it will be BETTER with advanced features. The battery life time is pretty good too. Only concern is, the door for the output terminals (USB/Adapter),that looks bit shaky! 2)It has only 90 days warranty. If you combine both(1) and (2) above, its risky to buy their product. I dont beleive in buying extended waranty for electronic stuff because the technology changes rapidly and, in another 2 years, you'll find yourself in a situation to buy a new camera than paying for Extended warranty. Since Kodak has one year warranty and my 'platinum' credit card has another one year free extended warranty, I had to decide between CX7430 and LS743. It was a tough decison, because both cameras are good. But the LS743 is the one that got PCMAG's Editors choice award (...) Looks like, it was a perfect decision. Since i had a KODAK 2MP camera and results were preety good, so i decided to go ahead with the latest LS743 and am happy to take that decision. The camera is supercool in looks and takes superb pictures both in light and dark. I think it is a very good camera in the 4MP range. YOU ALSO CAN GO ON LINE AT WWW.KODAK.COM AND THEY WILL HELP YOU WITH YOUR LS743 CAMREA. DON'T FOR GET TO BUY 6000 KODAK CAMERA DOCK/PRINTER IT WORKS GREAT, THE DOCK WILL CHARGE YOUR BATTERY . THE PITURES ARE EXCELLENT.THE CAMERA IS SMALL, FOR ME THAT IS GREAT. If you're new to the world of digital photography, the Olympus D-580 offers just the right blend of easy-to-use features and high-quality optics that delivers vivid pictures. The D-580 Zoom has a durable polycarbonate body with an attractive metallic accent on its sliding protective clamshell lens barrier. It also features a 4-megapixel resolution, 3x optical zoom, movie mode with sound, a bright LCD monitor to review images, and Olympus's new TruePic Turbo image processor, which speeds up the camera's start-up, shutter lag, recording and playback time. The 4-megapixel D-580 captures 2288 x 1712 pixel images for prints up to 11 x 14 inches. It also has 1600 x 1200 (2MP) and 640 x 480 (VGA) resolution modes. 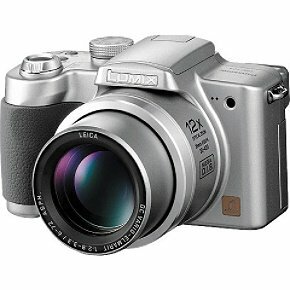 It features a 3x optical zoom that, when combined with a 4x digital zoom, delivers a total seamless 12x zoom. The aspherical all-glass zoom lens is constructed of 7 lenses in 6 groups and has a focal length of 5.8-17.4mm (35-105mm equivalent in 35mm photography) and an aperture range of f3.1-f5.2. The D-580 is one of the first Olympus models to feature TruePic Turbo, a new image processor that sharpens image clarity, contrast, and color for life-like results. This feature also makes the camera 30% faster in processing images and is combined with a super-fast shutter release time. The D-580 offers a menu architecture that's easy to navigate for fast access to the right settings with just the press of arrow buttons. Seven preset shooting modes can be accessed through the "Virtual Dial" (viewable through the LCD menu) to provide fully automatic exposure adjustments; these include Program Auto, Portrait, Portrait-Landscape, Landscape, Night Scene, Self Portrait, and Movie. The D-580 is PictBridge compatible, which enables you to transfer pictures from your digital camera to a compatible printer (such as the Olympus P-10), without a PC or image-editing software. All PictBridge devices share three basic features: camera-to-printer connecting, single-image printing, and uniform error messages (in case something goes wrong). Images are stored on XD Picture Card memory cards. The card's small size, about the same as a postage stamp, helps to keep the camera size down. The included 16 MB card will store approximately 16 images at 2288 x 1712 pixels (at HQ, JPEG setting). Images can be downloaded to either a Mac or PC via USB 1.1 connectivity, which means the camera can be connected to any USB-based Windows 98 Rev2Me/2000/XP and Mac OS 8.6 or later computer without installing any software. The camera is powered by 2 AA batteries (alkalines included, NiMH rechargeable recommended) or 1 CR-V3 battery. It measures 4.3 x 2.3 x 1.4 inches (W x H x D) and weighs 5.8 ounces (excluding batteries and storage media). i got this camera for Christmas and i love it because it is very easy to use and to hook it up to the computer is soo easy. This camera is an excellent value! It is very cheap for a four megapixel camera, has zoom, takes great, sharp, and colorful pictures! I bought this camera for my girlfriend based on what I had read about ease of use for this camera. You would be hard pressed to find a more user friendly camera in this price range or above. THe auto focus on this camera is excellent! We have taken lots of picures with this camera during the day and night and little have come out anything but clear and colorful. Two of the night photos I took of fireworks came out blurry but this is to be expected when not using a tripod. This is a great camera that has a very powerful flash and is easy to use. A word of warning would be not to even try using Alkaline batteries, they will be spent in about 20 shots. One warning, for outdoor wildlife enthusiasts, the zoom motor on this camera is very loud! Instead get one of the Lithium CR-V3 batteries which give excellent picture taking volume in this camera. I highly recommend this camera to anyone looking for an easy to use, great working and low priced camera. It is an excellent camera for this price (I bought it for $250 about 2 weeks ago). Last week I used it to take pictures in Niagara Falls during day and night. The pictures during the day are crisp. During the night, I held it by hand to take pictures of rapids and the water falls (without flash). The water flow effect was surpringly clear and bright. Its TruePic Turbo image processor is indeed very fast. I used the camera to take pictures of fireworks. During 10 minutes I took tens of pictures. However, it is quite necessary to have four recargable Ni-Mh AA batteries with this camera. It uses battery power pretty fast. I purchased this camera for my wife because of it's ease of use (point'n'click) and the lense is automatically covered when turned off (protects lense in her purse or briefcase). It is a nice camera, easy to use, picture quality is OK (my daughter's Kodak 6340 and my Nikon 5700 pictures are much sharper), good camera for beginners. Batteries do not last long, pictures blurred with full digital zoom. Keep shooting picture after picture without worry of losing battery power with the Casio Exilim EX-Z40, which features a new imaging processor that saves on power and increases battery life. 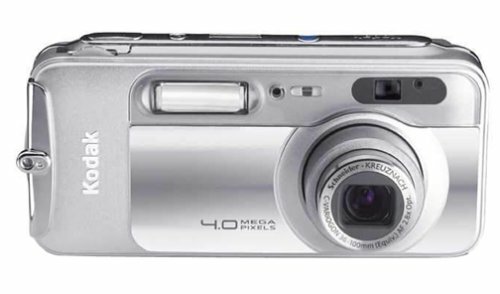 The 4-megapixel EX-Z40 also features a docking cradle for image transfer and battery charging, a quick start-up time of 1.6 seconds, an approximate 0.01-second release time lag, a 3x optical zoom, 2-inch LCD screen, 9.7 MB internal memory (compatibility with SD and MMC memory cards), and a movie mode with audio. 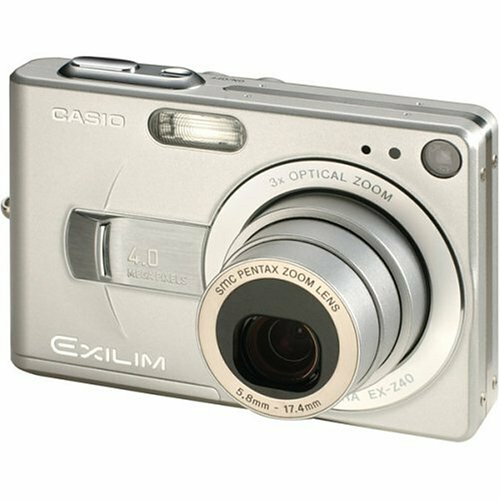 The Exilim EX-Z40 has a 1/2.5-inch square pixel primary color CCD that captures up to 4 megapixels of detail (2304 x 1728). It also offers the following resolution modes: 2304 X 1536 (3:2), 1600 X 1200 (2MP), 1280 X 960 (1MP) 640 X 480 (VGA). The lens uses a three-segment telescoping mechanism that makes it possible to provide 3x optical zoom capabilities in an amazingly thin camera configuration. The Pentax aspherical lens (6 lenses in 5 groups) has a focal range of 5.8-17.4mm (equifalent to 35-105mm in 35mm photography). A multimedia multitasker, the Exilim EX-Z40 operates as a digital voice recorder in addition to capturing video with audio. The camera's movie mode records video in AVI (motion JPEG) format at 320 x 240 pixels and 15 frames per second (fps). The internal 9.7 MB memory can hold approximately 30 seconds of video or 40 minutes of audio recordings. 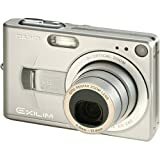 The Exilim EX-Z40 incorporates the Casio Exilim Engine, a newly developed compact image processing module with a 3-layer stack LSI that achieves high picture quality and speedy response using a 1.8V low-power system and makes the camera's compact dimensions possible. This camera has a battery life 2.5 times longer than the previous model (the EX-Z4), allowing up to 360 photos to be taken on a single charge. The Exilim EX-Z40 offers PictBridge functionality, which enables you to transfer pictures from your digital camera to a compatible printer without a PC or image-editing software. Images can be viewed and selected for printing right on the camera's LCD, with menus for print quantity, date, and index print. Images can be stored in the built-in 9.7 MB memory, or on optional Secure Digital (SD) or MultiMedia (MMC) memory cards. The internal memory can store approximately 4 Fine and 6 Standard 4-megapixel images. A docking cradle is included with the Exilim EX-Z40, which charges the battery and transfers images to PCs and Macs via USB 1.1 connectivity. 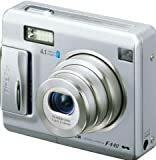 The camera is powered by a rechargeable lithium-ion battery (included), which provides power for approximately 360 snapshots or approximately 5 hours of voice recording. It measures 3.43 x 2.24 x .91 inches (W x H x D) and weighs 4.27 ounces (excluding battery and accessories). The Exilim EX-Z40 is a small wonder to look at and hold ... and to actually use. It's arguably the best-looking digital camera on the market today. One look at it and you'll want to buy one. The matching cradle is also just as "cute." Picture-quality-wise, it's good, but not as good as Canon's offerings. There's a certain softness to the pictures it takes, and you cannot adjust the sharpness level like you can on many (admittedly larger) cameras. The 2" LCD is just totally wonderful, but does put on some drain on the dimunitive battery. All in all, a pretty good package if a bit expensive. It's definitely something you can impress a lot of people with. I love my Casio. This is the second digital camera that I have owned, my first being a Sony Mavica. The size on this camera makes it so convenient to bring anywhere. It is very easy to use, especially with the accompanying camera dock to upload your pictures to the computer. Battery lasts forever. I can't find a bad thing to say about the Casio Exilim. If your looking for a good, pocket type camara with a lot of features, look no more. This camara is great. I love the quality and the awesome size. The battery is great, it lasts for 360 shots! The controls are great to, and the LCD is huge. Its bigger than most camara LCDs. Is shoots great movies(for a digital camara) and it can also has a recording voice feature. I love all the shots i've taken, they are alot better than my previous camara(Konica Minolta XG). The camara has a good grip for such a compact camara. You can put it in your pocket and take it anywhere. If your looking for a small, take it anywhere camara, with good photo quality and long battery life this is the camara for you. We bought this camera thinking we could take nice pictures in night events, sports, etc, because it has multiple ISO and shutter speed settings. But you can't control speed or exposure, and we can't have good night shots, unless it's just an scene. I'd rather buy a Canon or Sony the same price, not this fancy but useless Casio. I have been a Canon user all my life, and often recommend my customers to the Canon name (I work for a major electronics store in the camera department). So initially I was a little leary at purchasing a Casio camera... but I am not at all disappointed in the quality. Granted, I purchased it only two days ago, but I have taken over 70 pictures... and I am extremely impressed. The macro mode is phenominal, better then that of the Canon S400, allowing me to get practically on top of a flower with a clear picture. The other shooting modes on the camera are remarkable as well, even though I haven't had much of an oppurtunity to play with them. For instance, there is a sunset mode, which adds a reddish filter to the image, there is a portrait mode which blurs the background adding an effect to the subject, a landscape mode, and some other fun tools that allow you to take pictures of fireworks, to stitch yourself into a picture if there are only two people, and a black and white as well as sepia filter. The best part is the ease at accessing all of these modes. Some of the best features I have seen from this camera are the battery, allowing the user to take over 300 pictures with one charge with the LCD running , the memory which by using SD allows the speed of taking pictures to be incredible, and of course, the lens quality which is made by Pentax . The actual size of the camera is what sets it apart from the rest- it's thin and compact, perfect for throwing into a shirt pocket, or a purse. The only drawbacks I can see are the LCD in REALLY low light conditions tends to be a bit grainy, and the actual view finder itself is tough to use- especially for those who have vision problems- but since the camera is more or less designed to solely use the LCD, it works out. The only other recommendation I have is don't use the camera on normal mode- use it on fine if you want amazing quality pictures. Otherwise you may notice a grainy quality. No wonder its the best selling digital camera of the year. Sure you need a larger memory card and different batteries but all I did was buy some lithium batteries and they are still full powered and they arent that expensive! Its not like the memory cards are a million dollars so whats to complain? 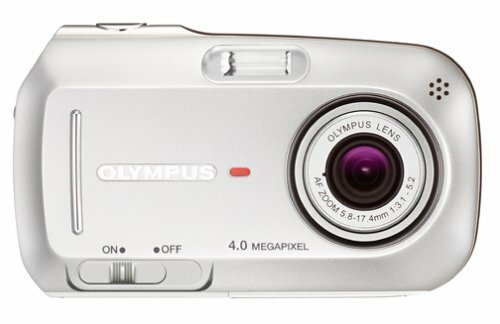 A great camera for under 200 dollars! Bonus: it is so hott!! The prints from this camera are as sharp as my Canon 35MM and I can carry it in my pocket. Excellent Value! I absolutely LOVE this camera!!! I previously owned a 3.1 MP camera by Sony that I honestly thought didn't take such great pics. So, I was wary about buying another Sony. I did some research on this one and found that it got a lot of positive feedback. I love taking pics wherever I go, so size was also a factor in choosing the right camera for me. You will be amazed at how tiny this camera is! The pictures look great and when I print them at home, they look as though I just picked them up at my local photo stop. They have different settings so you can choose just the right lighting and it even has a feature that allows you to take black & white photos. Please note that you need to buy an additional media card because at 4.1MP, the card it comes with only holds 8 pictures! It's very easy to use and definitely makes a great gift idea. Two of my friends have went on to purchase this camera and love it. Oh, as with any digital camera... make sure you invest in rechargeable batteries. WOW!! 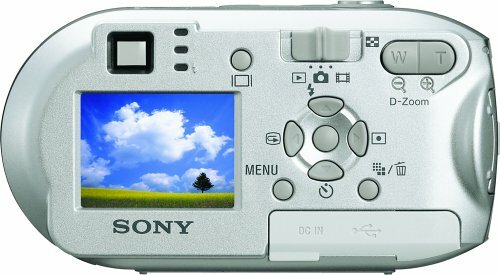 $200 For a good looking 4MP Sony Digital Camera??!! I should have bought this camera on Amazon instead of Circuit City's online site. Amazon doesn't tax you and will also give you a $25 coupon on some digital camera accessory purchases, and also if you buy $250 or more of electronics at Amazon, they'll give you a $50 certificate on your next purchase. So, if you buy this camera and then buy the SanDisk Memory Stick Pro (256MB for ~$60), you'll get that $50 certificate (act FAST!! offer ends AUGUST 1). With that $50 certificate, you can purchase those much needed rechargables on your next purchase, or go to Costco like me and buy that $20 Panasonic charger with 6 AA and 2AAA batteries in the package. Those batteries are good for digital cameras (2100 mAH). Not to bad for $20. I've used this camera for about a month, and its going great. Decided to buy screen protectors for it (saw some at Radioshack for ~6.00), and also just purchased that SanDisk 256MB Memory Stick Pro. That'll store about 100+ pictures on 4MP. The camera does eat up a lot of batteries, so rechargables are a must. Quality is excellent, but the zoom is only pretty good. But hey, it's only $200 and what do you expect? 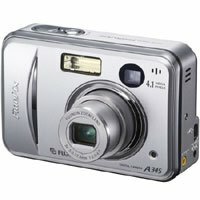 My girlfriend has an Aiptek, and although their price on their products are ~100, the aiptek digital cameras can't shoot in low to no light conditions at all. This sony definitely can. I also found a Minolta 4MP camera with opt. zoom for $220 at Amazon, but the appearance and size of it is not comparable to this Sony DSCP41. I'd pick this one even though it lacks the opt. zoom. Also, to the person that wrote about how this Sony digicam's lens is not protected, yah it isn't really that protected. Luckily the shutter comes on when it is not in use for about a min. or when you turn it off. Just not smudge the lens and clean it once in a while and it will be fine. I don't own this but was thinking about it... it says "The camera is powered by two AA batteries (alkalines included, NiMH rechargeables recommended). It measures 4 x 2.13 x 1.38 inches (W x H x D) and weighs 5.5 ounces without Memory Stick or batteries. " Speed is mostly what sets the A340 apart from previous cameras. Slide the camera cover open and you'll be ready to start taking photos in about three seconds. The camera also has a quick refresh between images--less than a second. Images come out of the A340 quickly, too, since it is compatible with the much-faster transfer speeds of USB 2.0 when uploading to computers that are likewise equipped. 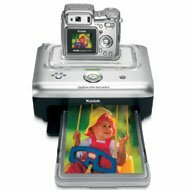 Featuring a 4-megapixel CCD sensor, the A340 can create images up to 2016 x 1512 pixels, which is enough information to create photo-quality prints up to 10 by 13 inches. The camera features a 3x Fujinon zoom lens. Also, the camera has a 1.7x digital zoom feature, but only when shooting in 2 MP mode. To get those close-up shots full of detail, the A340's macro mode can focus the camera on subjects just 3.6 inches from the lens. Shoot up to one minute of AVI video without sound at resolutions up to 320 x 240 pixels; up to four minutes at lower resolutions. The movies aren't camcorder quality, but they're fun and convenient, and they're perfect as e-mail attachments. 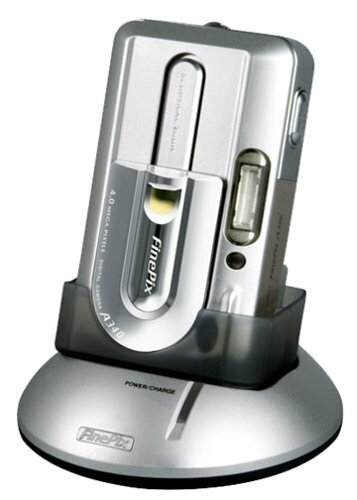 The camera includes cables that allow you to view your movies on NTSC (North American) and PAL (other regions) televisions and, of course, you can upload the files to your computer via the camera's USB interface. Fast processing: 3.3-second bootup time (duration between turning the camera on and when it's ready to start taking pictures) and a frame-to-frame time of 0.62 seconds. Images and video are stored on xD memory cards (16MB included). Files can be downloaded to either a Mac or PC via USB connectivity, which means it can be connected to any USB-based Windows 98/Me/2000/XP and Mac OS 8.6 or later computer without installing any software. This camera can transfer images at a faster USB 2.0 rate to computers installed with a USB 2.0 card. This camera is compatible with the PictBridge direct-printing standard. That means that it can connect and print directly to a number of printers by different manufacturers without additional software or even a computer. Learn more about PictBridge. The camera is powered by two AA-size batteries (alkaline included, rechargeable NiMH recommended). It measures 4.09 by 2.42 by 1.23 inches and weighs 5.1 ounces without batteries and memory card. The CP-FXA10 Picture Cradle faciliates easy image downloads, power recharging, PC-Cam mode, and also acts as a video platform when connected to a television set. It allows users to quickly download images through USB port connections, making it easy to store and share digital images electronically. The cradle's smart power system offers a two-hour recharge time for the FinePix A-series cameras' optional NH-10 Ni-MH battery pack. The cradle recognizes alkaline batteries and shuts off the recharger mode, protecting the camera and safeguarding the consumer. 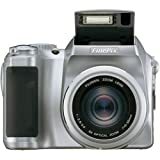 In addition, the cradle may be used in PC-Cam conferencing mode, and can be connected to other FinePix users through the FinePix Viewer 4.0 software package included with all new Fujifilm FinePix digital cameras. 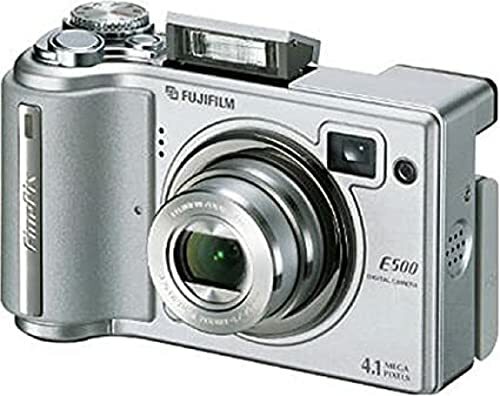 In addition, by using the CP-FXA10's Picture Cradle's video out port to connect to a television set, movies shot with the FujiFilm A340 can be enjoyed on a full screen and easily recorded with a VCR. So I must disagree with the reviewer from Maine, who believe it or not cannot seem to spell anything correctly, thus I would expect her to rate this camera low as it is probably above her to even know anything about a camera much less operate one. My sister purchased the originial of this camera over the summer for her internship with Laura Bush, at the same time my other sister and my brother were getting cameras for the first years of university life and I must say that of the three cameras I liked the Fuji the best. 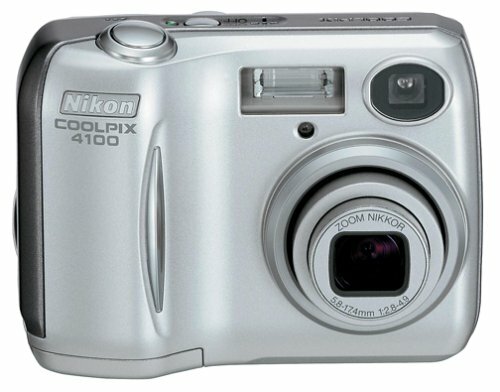 My first digital camera 4 years ago was a Nikon CoolPix and I will NEVER own another Nikon. I purchased the Fuji the other night and am so pleased with it. The pictures look amazing on the camera, on my computer and in print. No complaints here! Thank you Fuji for securing my loyality for years to come. Well, I like this camera! I purchased this camera this afternoon. I didn't buy it from amazon. I purchased it at a PC Richards. I knew the salesman and he gave me a good deal. Anyway, I was going to get the 3 pixal one, but that was out of stock. The salesman sold me this one at the same price, which was $200. I was deciding between this one and a canon, and he recommended this one. I have had it for an hour, and I love it. It is so easy to use. I just skimmed throught the instructions. I was able to navigate the menu's with no problem. I wanted to point that out, since a lot of the compliants are that it is not that easy to use. I have about ten pictures that I took so far. I used my new puppy as my test subject. They came out great. It is easy to pick out the pictures that you want, and the ones that you want to delete. I can't wait to print some up. I just needed one with the basics. This has that and more. I love it, and I am glad I purchased this one. It is highly recommended. I only gave it four stars, because I wish the memory card held more. Don't have second thoughts on this. It is definitly a good price, and compact. I'm suprised there are a few reviews that aren't so good, we love this little camera! The pictures are clear,sharp,nice colors, and theres some really great features for being such an affordable price. This is a really good family camera. Not for the professional. above website will show pics of low light, indoor light, and outside. PS. cradle is optional. USB connects to your computer to upload. It would be cheaper to get a $15 recharger & batteries. With its slide-away lens cover and aerodynamic design, it's clear at first sight that the Stylus Verve is not just another digital camera shoved into a bulky 35mm point-and-shoot's case. In fact, it's a powerful, easy-to-use, four-megapixel wonder that features a large 1.8-inch LCD display that's viewable even in full sunlight. The Stylus Verve even comes in six colors: blue, red, silver, white, black, and red. The Stylus Verve features a four-megapixel CCD imager, which can gather enough information to create images approximately as large as 1,714 by 2,286 pixels. In other words, you'll be able to make photo-quality prints of your pictures at sizes up to 11 by 15 inches. The camera's 2x optical zoom lens--equivalent to a 35-70mm lens on a film camera--combines with a 4x digital zoom to simulate the power of an 8x zoom lens, but only at lower resolution settings. The Stylus Verve can capture short video clips with sound in the movie mode setting. This feature won't likely persuade anyone to abandon their camcorder, but it is a fun and convenient way to capture movement while you're out taking pictures. The amount of video the Stylus Verve can store is limited only by the amount of memory available. Virtual Mode Dial with 10+ shooting modes 1.8-inch semi-transmissive LCD 130k pixel TFT) for taking and viewing pictures (no optical viewfinder) PictBridge enabled -- print directly to any PictBridge-compatible printer, with or without a computer Semi-Transmissive TFT LCD's are multi layered, which allows the image on the LCD to be viewed in direct sunlight situations. Quick View button allows you to review the shot you just took. The TruePic Turbo image processor enhances color fidelity (the range of color, saturation, and brightness), signal-to-noise response (relationship of accurate electrical signals to unwanted signals like static disturbances creating noise), and high-resolution image clarity (sharpness) over other image processors while speeding up image data processing times. The end result is clearer and more color-accurate photos and noticeably faster startup and shot-to-shot recycle times. 1. Fast shutter release (my Canon S-200 takes 3+ sec., 5+ flash). 2. Small and light (for backpacking, travel). 3. Point and shoot zoom(5X plus with image stabilization). 4. 4+ megapixel, under $250. 5. No proprietary batteries, 2 AA preferred. Up until now, nothing has come close. Then I read in Business Weekthat the LZ1 and LZ2 had become the best selling cameras in Japan within several months of their introduction. No independant reviews were available (even CNET) so I bought the LZ1 on the strength of it's technical spec's and my previous experiences with Panasonic products. I took the LZ1 to the rodeo several days ago to test it under demanding conditions. I used the "sports" setting and burst mode(four exposures in about 1 1/2 seconds under those circumstances), all freehand. The results were stunning! No noticeable shutter lag, no blurry or out of focus pictures, all action frozen. Simply put: point, shoot, you got it!